Set in Boston at the end of the First World War, New York Times bestselling author Dennis Lehane’s long-awaited eighth novel unflinchingly captures the political and social unrest of a nation caught at the crossroads between past and future. 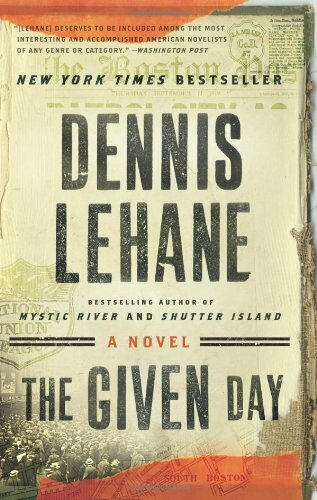 Filled with a cast of unforgettable characters more richly drawn than any Lehane has ever created, The Given Day tells the story of two families—one black, one white—swept up in a maelstrom of revolutionaries and anarchists, immigrants and ward bosses, Brahmins and ordinary citizens, all engaged in a battle for survival and power. Beat cop Danny Coughlin, the son of one of the city’s most beloved and powerful police captains, joins a burgeoning union movement and the hunt for violent radicals. Luther Laurence, on the run after a deadly confrontation with a crime boss in Tulsa, works for the Coughlin family and tries desperately to find his way home to his pregnant wife. Dennis Lehane was born and raised in Dorchester, Massachusetts. He has written eight novels, A Drink Before the War; Darkness, Take My Hand; Sacred; Gone, Baby, Gone; Prayers for Rain; Mystic River; Shutter Island; and The Given Day as well as Coronado, a collection of short stories. Mystic River was a finalist for the PEN/Winship Award, and it won both the Anthony Award and the Barry Award for Best Novel as well as the Massachusetts Book Award in Fiction given by the Massachusetts Center for the Book. Before becoming a full-time writer, Lehane worked as a counselor with mentally handicapped and abused children, waited tables, parked cars, drove limos, worked in bookstores, and loaded tractor-trailers. His one regret is that no one ever gave him a chance to tend bar. He lives in the Boston, Massachusetts area. The Given Day transports readers to 1918 Boston and touches on the lives of two families—one black, one white—as they are swept up in the maelstrom of history. How are their experiences similar? How are they different? Dennis Lehane writes The Given Day from the perspectives of two very different men. What brings Luther Laurence and Danny Coughlin together? Does their friendship ring true? One of the themes of the book is the notion of family—both the blood kind and the kind a person willingly creates on his own. How are these ideas of family manifested? Do you see one as being more important than the other? Can a person belong to two kinds of family at the same time? The Given Day centers on the Boston Police Strike of 1919 at a time when fiercely held convictions about work and freedom underwent enormous change at great cost to human life and relationships. Nearly a century later, what is the role of unions in America today? How do the working conditions for Luther and Danny compare to contemporary conditions? Do you think unions are necessary today? How do the themes in the book—race, politics, class, family, immigration, nepotism, corruption—reflect issues facing America today? Injustice is another theme that Lehane explores in the novel. How does injustice manifest itself in democratic societies? Can it be redressed? If so, how? What role does Babe Ruth play in the narrative? What did the introduction of his character add to your understanding of the novel’s main themes? Who do you think is the most sympathetic character in the story? Why? What is the relationship between Danny Coughlin and his brothers Connor and Joe? What role does Danny play in each character’s development? How do they, in turn, influence him? Talk about the relationship of Danny and his father. How are they alike? How are they different? How do their similarities and differences shape their relationship? What role do women play in the novel? How do they impact the men? How are anarchists and immigrants portrayed in the novel? Do you see any echoes of the government’s response to events then in the America in which we live today? Consider your own life experiences. How would you have fared in the America of a century ago? If Danny and Luther were transported to 21st-century America, what might they think of our world?